UPDATE (3/2): Because of Sunday’s forecast of cold weather, Monarch March has been rescheduled for next Sunday (March 10) from 1-4 p.m. The brilliant orange-and-black monarchs are among the most recognizable butterflies that call the Americas home. Texas is fortunate to be among the first states to witness the monarchs’ spring pilgrimage back to their northern homeland. The Lone Star State and the Brazos Valley are situated between the monarchs’ primary breeding grounds in the north and their wintering areas in the south. That means we get to witness the mesmerizing migration in the spring and fall. 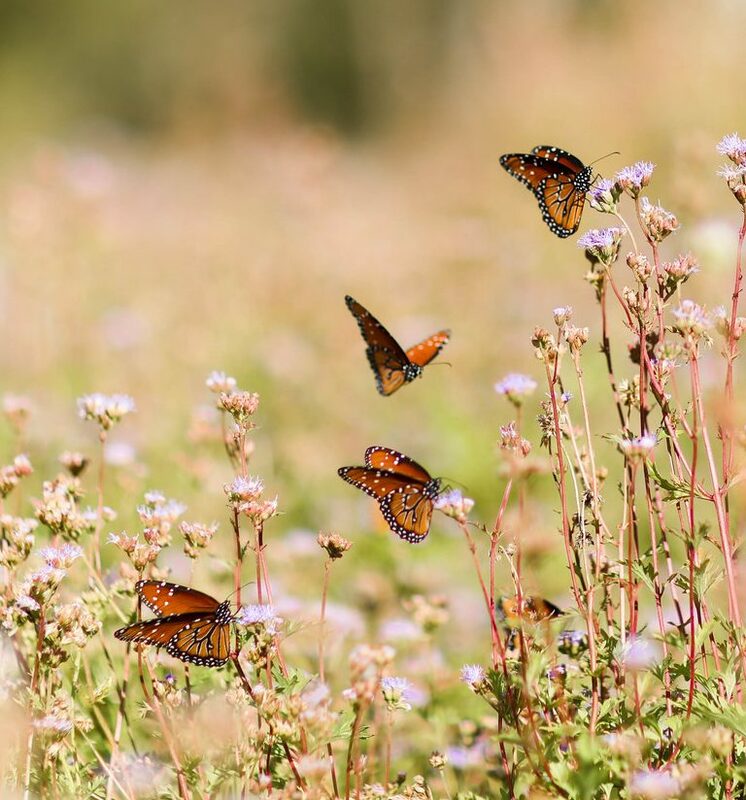 To commemorate the butterflies’ spring journey, the College Station Parks & Recreation Department will host Monarch March on Sunday from 1-4 p.m. at Lick Creek Nature Center. Admission is free. Monarch March is a fitting tribute to the winged creatures that graze our landscape each spring. The day will be full of interactive and educational activities with the help of community organizations such as Brazos County Master Gardeners, Brazos Valley Master Naturalists, Texas A&M Entomology Department, Urban Interface, A&M Garden Club, and Butterflies in the Brazos. Experts from these groups will host a booth that instills an appreciation for wildlife through fun, educational activities. Events will include a march through Lick Creek Park’s premier monarch waystation, butterfly arts and crafts, learning about butterfly wings, a migration obstacle course, how to create a waystation or butterfly garden, and much more. Monarch March celebrates this fascinating time of year while spreading the word about the importance of creating habitats to support these beautiful winged creatures. Join us as we welcome the iconic black and orange butterflies back into Aggieland! For more information, visit cstx.gov/monarchs or call 979-764-6216. Hallie Hutchins is in her fourth year as a marketing staff assistant in the Parks & Recreation Department after graduating from Texas A&M in 2014 with a degree in sports management. She has previously worked with the Dallas Sidekicks professional soccer team and Texas Team Junior Golf. Originally from White Oak, Hallie also attended Kilgore College and was a member of the famed Kilgore Rangerettes dance team. College Station is perfectly situated to witness the fall monarch migration. The black and orange beauties funnel their way through the Brazos Valley each year from September through November. At distances up to 3,000 miles, the monarch migration is among the world’s longest wildlife journeys. The monarchs fly up to 250 miles a day from their summer habitats to their winter sanctuary in the mountains of Mexico. Waystations and pollinator gardens serve as stepping stones where they can rest and recharge along the way. Unfortunately, as the number of friendly stopping points has declined, the monarch population has dwindled. The good news is that kind-hearted citizens are taking action. Locally, Butterflies in the Brazos has endeavored to recreate native habitat by building a butterfly garden in Bee Creek Park (1900 Anderson St.). You can become a part of this community effort by participating in the Butterflies in the Brazos Planting Day on Saturday, Sept. 22 from 8 a.m.-noon. Volunteers will plant milkweed and other nectar plants along the park trail. You’ll need to bring water, appropriate work shoes or boots, gloves, sunscreen, and garden tools such as rakes or shovels. Contributing nectar-producing plants or host plants for butterflies isn‘t required but would be appreciated. Thanks to the College Station and Bryan Lowe’s, Culligan Water, Shipley’s Donuts College Station, Farm Patch, Producers Cooperative, Home Depot, Aggieland Grass and Stone, Living Earth, and Legacy Ace Hardware for donating materials and supplies. For more information and a list of suggested plants to bring, visit cstx.gov/monarchs. After enduring the summer heat, fall is always a welcome relief in Texas. It’s also an ideal time to sow nectar plants for the monarch butterfly migration and to prepare your gardens for the spring. Texas is an important stop in the journey since it’s situated between the butterflies’ main breeding grounds in the north and their wintering areas in the south. The monarchs funnel through the Lone Star State in both fall and spring. The butterflies are expected to pass through the Brazos Valley in early October, according to Jane Cohen, the A&M Garden Club’s butterfly chair. She recommends growing nectar-producing plants to benefit the monarchs. The blooming flowers provide a sweet liquid that provides energy for the insects as they travel. Cohen says it’s best to plant in locations with plenty of sunshine since adult butterflies typically prefer to feed in the sun. Vibrant colors such as red, yellow, orange, pink and purple tend to attract adult butterflies the most, and they also are drawn to patches of the same plant or color of flowers. It’s a good idea to incorporate continuous-blooming annuals in islands of color, or clusters of nectar plants and is beneficial to include milkweed either nearby or mixed. You should also be mindful of the flower’s orientation. It’s important that flower blossoms are flat-topped or clustered to make a platform for the butterfly to land and walk. Butterflies need nectar throughout the adult phase of their life span, so plant for a continuous bloom so that when one plant stops blooming, another begins. Milkweed is the only plant the caterpillar eats and is where butterflies lay their eggs. That makes an abundance of milkweed vital, especially in the spring. Milkweed can be planted in early fall, but the seeds are best planted in November when it’s too warm for the ground to be frozen, but too cool for the seeds to sprout until spring. Tropical milkweed is a primary monarch food source, but it should be cut back to the ground in late fall to encourage the butterflies to continue their journey to Mexico. An excellent way to start your garden is to pick up two free Butterfly Retreat seed packets from our Central Park office at 1000 Krenek Tap Rd. Each pack covers more than 20 square feet and contains a wildflower mix that’s perfect for creating a butterfly habitat. Butterflies in the Brazos Community Meeting: Share your ideas and plans to promote monarch butterflies and other pollinator habitats on Wed., Sept. 27 from 9 a.m.-noon at the Brazos Center. The free gathering includes education about local groups and their efforts to increase awareness about butterfly preservation, native plants for butterflies, and other pollinators. We will also explore ways to involve residents and identify community partners for networking along with an overview of basic gardening tips. The program will feature speakers from the A&M Gardening Club, Texas Master Naturalist, Keep Brazos Beautiful, Native Plant Society, Master Gardeners, Monarch Gateway, the USDA/TAMU Future Scientist Program, and the College Station Parks & Recreation Department. Landscaping and Plants for Butterflies: Ann Boehm of Texas A&M AgriLife Extension Service Master Gardeners and Butterflies in the Brazos will give an overview on landscaping and plants for butterflies. The free class will be Oct. 14 at 11 a.m. at Producers Ag Center (1800 N. Texas Ave.) in Bryan. You don’t need to RSVP. For more information, go to cstx.gov/monarchs.